Those who are employed in the realm of Social or Internet Marketing definitely have to know the existence of at least 4 different conditional stereotypes, these are Baby Boomers and Generation X, Generation Y and Generation Z (Millenials). According to Socielogist Karl Mannheim (who is among the founding fathers of classical socielogy) – "All members of a generation share a similar collective experience" or in other words people are categorized in generations depending on when they were born. As stereotypes they're generalization of people born in different periods of time and sharing same or similar traits. Because of the age and the conditions they grew up and as they share those general spirit of time and age, they tend to be more or less behaving in a similar ways in how they think save / spend money or share some common approach to life choices and attitude towards life and worldview. But before proceeding to the 4 main cohert provisional stereotypes, its worthy to mention how these four common trait generations came to existence with a little bit of pre-history. 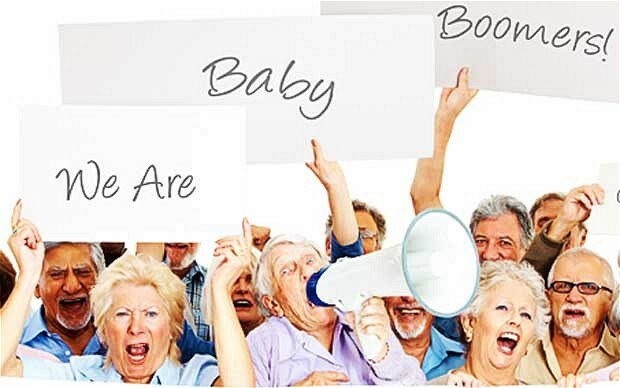 The pre WW I and WW II world situation and the First and Second World War played a pivotal role in forming the social conditions necessery for the development of the baby boomers. Born in period: 1912 – 1921 who came at full maturity around 1930-1939 right in the beginning of WW I (all of whom are already deceased) as of 2018 as a cause of the war uncertainty and the havoc and the war conditions were very conservative, compulsive savers, tried their best to maintain a low debt. They had the mindset (responsibility) to leave some kind of legacy to their children. They were very patriotic, oriented towards work before pleasure, had a great respect for authority and had a strong sense of moral obligation. For all this character traits of this people undoubtfully a key role played the strong belief in God mostly all people had at the time. Born in year period: 1922 to 1927 who came to a mature age exactly at the terrible years of Second World War. People of that time were either fighters for or against the Axis Powers or the Central Powers with the common shared goal to fight against the enemy (of course there are multiple of people who were just trying to survive and not taking a side in this meaningless war). The current amount of people living are estimated to few million of deathbed elders worldwide. As above conditional generations types mentioned are of importance for historical reasons and most of the people belonging to those depression pre WWI and WW II era are dead or just a few millions an overall in un less-consuming age (excluding the medicine consumption which is higher compared to youngsters). I'll further proceed further with the Baby Boomers, GEN X, Y, Zs who are de-facto the still active members participating to society and economy more or less. 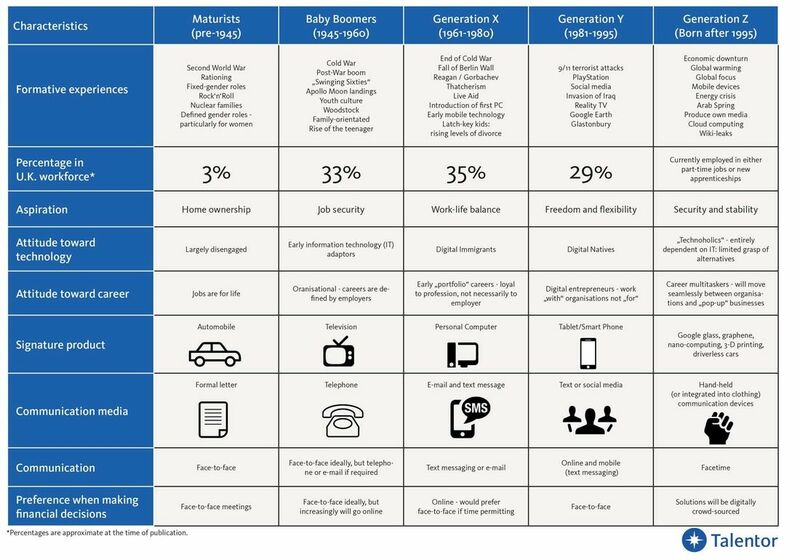 So what are these 4 Stereotypes of Generations that and why are so important for the modern marketers or business manager? These are people who have been defined by a birth year range (period) from early to mid 1940s until 1960 and 1964. In Europe and North America, boomers are widely identified with privilege, as many grew up in a time of widespread government subsidies in post-war housing and education, and increasing affluence. As a group, baby boomers were considered the wealthiest, most active, and most physically fit generation up to the era in which they arrived, and were amongst the first to grow up genuinely expecting the world to improve with time. They were also the generation that received peak levels of income; they could therefore reap the benefits of abundant levels of food, apparel, retirement programs, and sometimes even "midlife crisis" products. The increased consumerism for this generation has been regularly criticized as excessive (and that's for a good reason). One feature of the boomers was that they have tended to think of themselves as a special generation, very different from those that had come before or that has come afterward. In the 1960s, as the relatively large numbers of young people became teenagers and young adults, they, and those around them, created a very specific rhetoric around their cohort, and the changes they were bringing about. This rhetoric had an important impact in the self perceptions of the boomers, as well as their tendency to define the world in terms of generations, which was a relatively new phenomenon. The baby boom has been described variously as a "shockwave" and with a methapors such as as "the pig in the python". Generation X is considered the people born in the following birth year period 1960 forward in time until 1980s. A specific feature in the 60s-80s period was the shifting societal values, perhaps the spring of this generation was also connected to the increasing role and spread of communism in the world. Sometimes this generation was referred as the "latchkey generation". A very common trait for Generation X was the reduced adult supervision over kids when compared to previous generations a result of increasing divorce rates and the increased role of one parent children upbringing (in most cases that was the mother) which had to be actively involved as a workforce and lacked physically the time to spend enough time with its children and the increased use of childcare options in one parent families. They were dubbed the "MTV" (Music Television) generation – that was a hit and most popular music TV in the early 1990s. The kids representing generation X were described as slackers, cynical and disaffected. The cultural influences dominating the tastes and feelings of the teen masses of that generation was musical genres such as punk music, heavy metal music, grunge and hip-hop and indie films (independent films) produced outside of the major film studio system. According to many researches in midtime those generation are described as active, happy and achieving a work-life balance kind of lifestyle. People belonging to Generation X are described as people with Enterpreneural tendencies. Just to name a few of the celebrities and successful people who belong to this generation, that's Google's founder Sergey Brinn & Larry Page (born in 1973), Richard Stallman (founder of Free Software movement) as well movie and film producer celebrities such as Georgi Clooney, Lenny Kravitz, Quantin Tarantino, Kevin Smith, David Fincher etc. According to United Kingdom survey study of 2500+ workers conducted by Workfront, GEN X are found to be among the hardest working employees in today's workforce. They are also ranked high by fellow workers for having a strong work ethics (about 59.5%), being helpful (55.4%) and very skilled (54.5%) of respondents as well marked as the best troubleshooters / problem solvers (41.6%) claimed so. 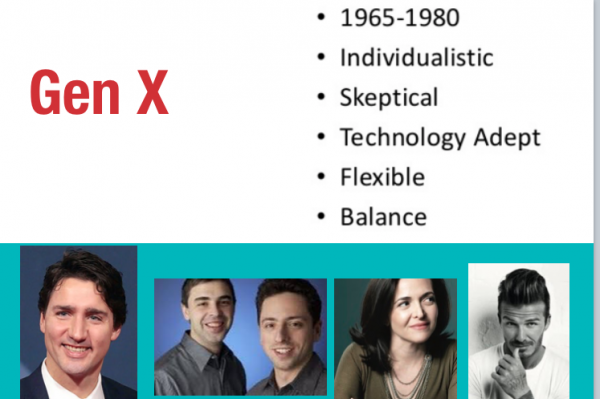 According to research conducted by Viacom, gen x they have a high desire for flexibility and fulfillment at work. Following Generation X came on earth Genreation Y the birth period dated for this kids were years are stretchy year period that this generation is described are years 1980s – 1990s to yearly 2000s where birth period range of those ppl ends. This kids are descendants of the GEN X and second wave Baby Boomers. In the public this generation is referred as "echo boomers". 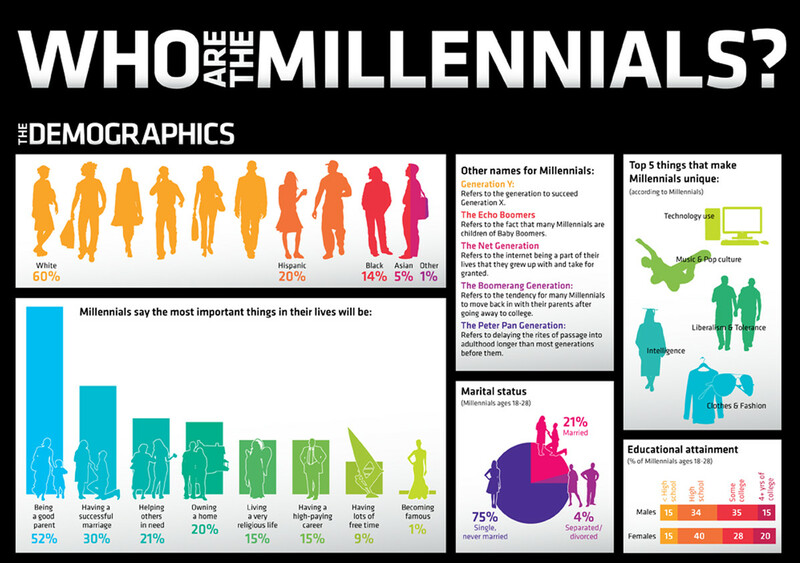 The Millenials characteristics are different based on the region of birth, they're famous for the increased familiarity with communication, media and digital technologies. There upbringing was marked by increase in liberal approach to politics. The Great recession crisis of the 2000s played a major impact on this generation because it has caused historical high levels of un-employment among youngsters and led to a possible long term economic and social damage to this generation. and how it is communicated with. As I am born in 1983 me and my generation belongs to Generation Y and even though Bulgaria before 1991 was a Communist regime country, I should agree that I and many of my friends share a very similar behavior and way of thinking to the GEN Y stereotype described, but as I was born in a times of transition and Bulgaria as a Soviet Union Satellite at the time has been lacking behind in fashion and international culture due to the communist regime, me and my generation seem to be sharing a lot of common stereotype characteristics with Generation X such as the punk-rock, metal, hip-hop culture MTV culture and partly because of the GEN X like overall view on life. Among most famous representative successful people of the Millenials generation are Mark Zuckerberg (Facebook founder), Prince William (the second in line to the British throne), Kim Jong Un (the leader dictator of North Korea) etc. Following Millenials generation is GEN Z, demographers and researchers typically set as a starting birth date period of those generation 1990s and mid 2000s. As of time of writting there is still no clear consensus regarding ending birth years. This is the so called Internet Generation because this generation used the internet and Smart Mobile Phone technology since a very young age, they are very confortable with technology (kinda of wired) and addicted to social media such as Facebook / Twitter / Instagram etc. Because of the level of digital communication, many people of this generation are more introvert oriented and often have problems expressing themselves freely in groups. Also they tend to lack the physical communication and more digitally community oriented, even though this depends much also on the specific personality and in some cases it is exactly the opposite. As a Marketer, Human Resources hiring personal specialist, a CEO or some kind of project / business manager it is a good idea to be aware of these 4 common stereotypes. 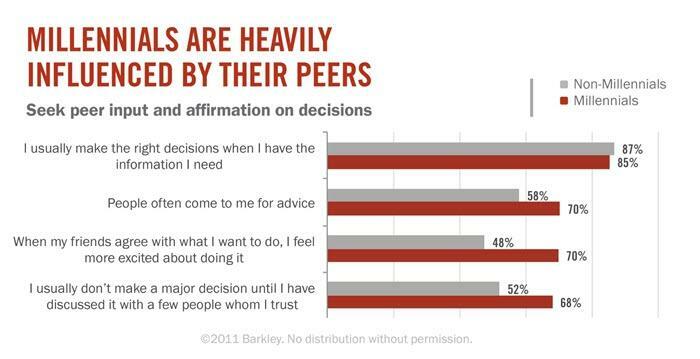 However as this are stereotypes (and a theory) as everything theoritized the data is slighly biased and untrue. The marketer practice shows that whoever conducts a marketing and bases his sales on this theoritizing should consider this to be just one aspect of the marketing campaign those who are trying to sell, stuff ideas or ideology to any of those generation should be careful not to count 100% on the common traits found among the above 4 major groups and consider the individuality of person everyone has and just experiment a little bit to see what works and what doesn't. Also it should be mentioned these diversification of stereotypes are mostly valid for the US citizens and Westerners but doesn't fully fit to ex-communist countries or countries of the Soviet union, those countries have a slightly different personality traits of person born in any of the year periods defined, same is more or less true for the poor parts of Africa and India, Vietnam, China and mostly all of the coomunist countries ex and current. It should be said that countries who belonged to the Soviet Union many of which are current Russian Federation Republics have a personality traits that are often mixture of the 4 stereotypes and even have a lot of the traits that were typical for the WW I and WW II generations, which makes dealing with this people a very weird experience. Nomatter the standard error that should always considered when basing a marketing research hypothesis on Generational Marketing (using generational segmentation in marketing best potential customer targets), having a general insight and taking in consideration those stereotypes could seriously help in both marketing as well as HR specific fields like Change Management. 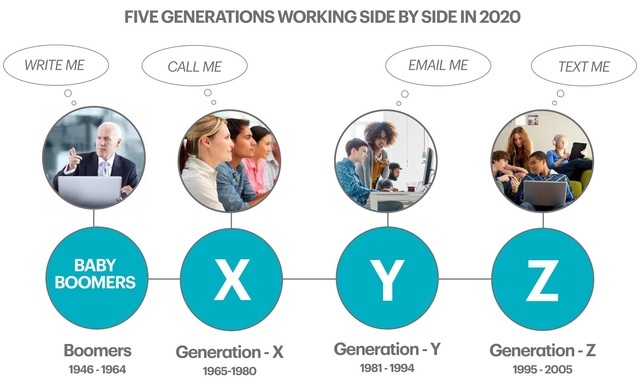 If you're a marketer, I recommend you take a quick look also on following very educative article Generational Makarketing and how to target each of the GEN X, Y, Z and Baby Boomers and what works best for each of them. Nomatter what just like all Theories, the theory of Boomers and the Generation segmantation is not completely true, but it gives a good soil for reasoning as well definitely helps for people involved in sociology and business. Hope the article was interesting to you …. What was your Generation like? Those who are living in ex-communist countries who have been through the so called "Perestroika" – Pre-structuring of economy and in the so called privatization process which is selling factories, land and whateve in a country to a private sector business investors have already experienced the so called "Pyramidal" structure businesses which at the end collapse and left after itself a tens of thousands of cheated "investors" without their capital money. In my homeland Bulgaria, during this pre-structuring which in practice was "destructioning" there was thousands of companies for a very long period of time who somehow used this pyramidal structures to steal people investments which already melted in times because of the severe inflation that invaded the country. Near my city in Dobrich. There was a company called Yugoagent started by a "serbian Pharaoh – a charlatan CEO" whose company was promising extraordinary profit interest for people who invested money in Yugoagent as well as big reduction of prices of all investors to purchase "white technigue" home equipment from Yugoagent stores. What happened was maybe between 10 000 to 30 000 of people because "investors" to Yugoagent led only by the blind faith and personal desire to earn. The interest offered by Yugoagent was more than 10% to money put in, I believe he was offering 30% of interest or so and people easily get into the trap of his pre-determined to collapse company. What happened after was Mirolub Gaich's company survived for few years while some of the "investors" ripped benefits, where the multitude just lost their money because of epochal bankruptcy of YUGOAGENT.… I know even some of my relatives has been fooled into the obvious fraudulent business, because our society in Bulgaria lived in communism and was not prepared to face the sad reality of money only centered economy – the so loudly proclaimed as "just" democracy. Today there are plenty of companies around the world still opened and operated under the same fraudulent model leaving after their bankruptcy their makers with millions in banks smartly stolen and claimed as company losses right before the collosal company collapse. A friend of mine Zlati, took the time to invest some time to research more into how this fraudulent Scheme works and found some references to wikipedia which explains the Scheme in details. Thus I also red a bit and thought my dear readers might be interested to know also how the scheme works. I believe it is a must for anyone who has the intention to be in business. It is good to know to escape the trap, cause even in Pro and High profit businesses there are companies operating under the same hood. 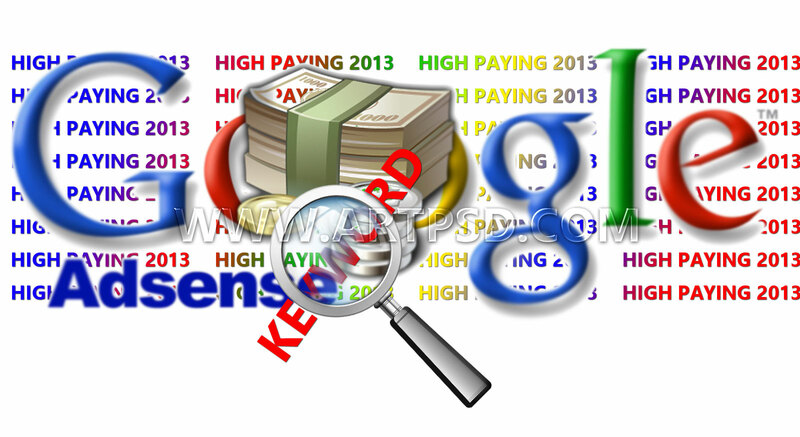 Today there are plenty of online based companies today who are somehow involved into Offshore business or even do some kind of money laundry frauds, while offering beneficial investments in a booming companies. It is useful for even ordinary people to get to know the fraudulent scheme to escape from it. With the worsening crisis, the fraudulent activities and companies that does some kind of fraud to make profit increased dramatically and thus the old but well known fraudulent model is blooming. A Ponzi scheme is a fraudulent investment operation that pays returns to its investors from their own money or the money paid by subsequent investors, rather than from profit earned by the individual or organization running the operation. 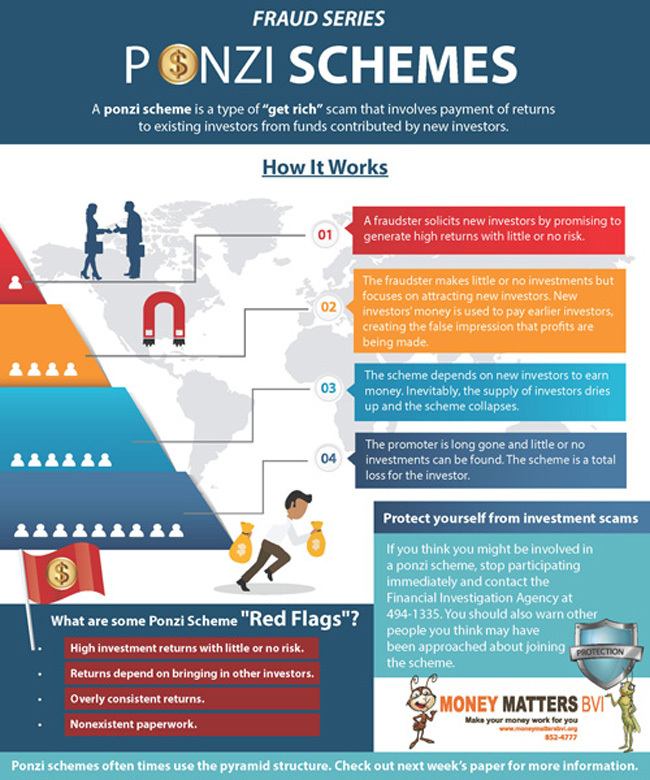 The Ponzi scheme usually entices new investors by offering higher returns than other investments, in the form of short-term returns that are either abnormally high or unusually consistent. Perpetuation of the high returns requires an ever-increasing flow of money from new investors to keep the scheme going The system is destined to collapse because the earnings, if any, are less than the payments to investors. Usually, the scheme is interrupted by legal authorities before it collapses because a Ponzi scheme is suspected or because the promoter is selling unregistered securities. As more investors become involved, the likelihood of the scheme coming to the attention of authorities increases. The scheme is named after Charles Ponzi, who became notorious for using the technique in 1920. Ponzi did not invent the scheme (for example, Charles Dickens' 1844 novel Martin Chuzzlewit and 1857 novel Little Dorrit each described such a scheme),[ but his operation took in so much money that it was the first to become known throughout the United States. Ponzi's original scheme was based on the arbitrage of international reply coupons for postage stamps; however, he soon diverted investors' money to make payments to earlier investors and himself. I'm trying to learn some basic Serbian. It is rather ridiculous, we are not being tought even basic Serbian in Bulgarian primary and high schools. Serbia is just one border away and besides that we Bulgarian and Serbs share same Orthodox Christian faith and similar existence. Over the last 10 centuries, we Bulgarians and Serbians was both under Turkish Yoke. Even nowdays most of the problem of Serbians and Bulgarians are very similar. Both of us are trying to survive and earn basic money for their daily living. Culturally our two nations are very similar too, thus I decided today to take little time and learn some basic Serbian. Learning Serbian for Bulgarians seems to be a generally easy, I listened from friends who speak Serbian a Bulgarian can learn talking some Serbian in just few weeks time, this is logical as both our languages share the same etymological roots from Cyrillic ( Glogolic / Glagolica ). One other reason is I'm very interested nowdays in Antrophology and from anthropological perspective, speaking or at least in basic understanding Serbia as closest nation Language helps understand more about Slavonic language and early language structure and gives more knowledge on language history. It is worthy to mention that as I heard from my Serbian friend Andrea, Serbians nowdays are mostly writting in Latin and rarely use Cyrillic (Church Slavonic). However in the Church and among people who try to live a true Christian life, use of Cyrillic is more widespread. Learn Serbian – English Lesson 11 – Verb "to be"
Learn Serbian 101 – How Old Are You ? I'm still heavily researching on Mind Control Applications as well as how the our brains could be intentionally mislead to do not our will. I myself am not watching TV for years now and I know pretty well the TV programs are one big non-sense. Loosing interest into television came natural for me as sometime in my development in life I found I can use computer to gather a data of my preference. As computers and internet gave me more control over choice what I want to learn I quit watching TV completely. However now I'm starting to realize even though I haven't watched TV for a long time the fact that I have watched plenty of Television as a child has unintentionally influenced me as a purpose. The real way how television influence us and makes us prone to suggestability is through putting the watched in a state similar to a hypnosis. I personally don't believe in the hypnosis as it is an occult practice and I think Christians are not suspectable to be influenced in the same way as non-Christians as it is up to God to decide how a certain technology will influence the individual. However most of us people nowdays are not a regular church attendants and we don't regularly pray and ask God for mercies and blessings therefore this makes us away from God and makes us more vulnerable to satanic agendas like hypnotism to be able to have influence on us…. Also by TV and modern pop culture, we have been encouraged to not stick to our cultural roots but to separate ourselves and accept an empty non-sense ideology that doesn't have any core besides money and consumerims. 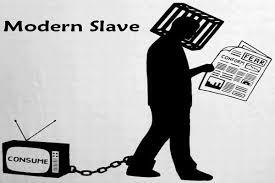 In that sense the TV and medias plays the most significant role nowdays. The internet as lately we're hearing about PIPA, SOPA and all kind of legislations regulations corrupted 0politicians try to vote for could be soon filtered too. If that happens the situation with using computers to inform ourselves will be not so much different than with TV's and other medias. Anyways we are not helpless as we can educate people and show them the real face of the things, so they can finally realize that this whole deception and anti-religious propaganda on the TV and vows for a life without rules is the greatest deception of our age. WIth TVs, radios, music, Mobiles, Ipads, IPhones or nomatter what kind of latest technology we can never be happy while living without God. Ever wondered, why and how America is still officially a super-power? Many people still believe, America has something superior to offer, has some extraordinary scientists, latest technology or plays key role in global economy because of their BIG money. This is one big deception the Truth is America and Americans have no money at all, they live in constant increasing debt. They constantly issue a financial boundaries to keep the economic balloon continue its artificial bloom. In that sense the constant print of American Dollars by the Federal Reserve is in nothing different with what was happening in the Soviet Union. A super-production, too much currency printing and mega inflation leading to devaluation of currency. The effect is nobody wants to buy the Soviets currency because its devaluated = too low value. The consequence is the low valued currency can buy less goods and therefore people become poorer and poorer day by day because of the currency crash. The only difference between the Soviet Union and America is that USSR decided to put an end to this growing agony which would sooner or later lead to a civilian war or a huge people rebellion. The globalized economy, if its looked from a helicopter view, suffers from the same problem. As the globalized economy is closed economic system in development. Though in its early stage globalization leads to many goods like, the decrease of goods costs, the bads its produce are way bigger. Just to name a few of the evils of globalization (ever increasing local unemployment), ever increasing costs of labor unbalanced distribution of capitals, increase of sicknesses due to consumption of products being produced with a main goal of making money. 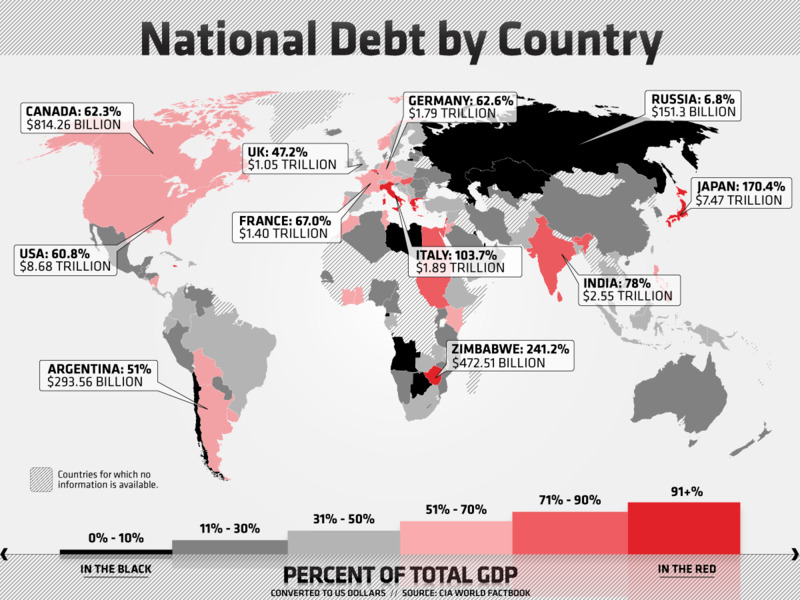 US Debt Increasing deb will surely lead to GLOBAL ECONOMIC COLLAPSE! Besides that "thanks to Internet" and this kind of medias the local physical communities through which the society used to function are being destroyed and this is probably the biggest evil – direct result of globalization. Actually probably a lot of people do not realize it but Internet and Mobile Phones are the main "increase" globalization tools nowadays. Also a consequence of Globalism is increased need for people to travel in order to their daily duties, this is also having a negative impact on individuals health (traveling too much is not healthy). Understanding the Financial Crisis – very well explanation! Probably the worsest of all is the pollution. Increased globalization leads to increased pollution, increased pollution leads to climate changes. Climate changes leads to changes in people's attitudes (climate has a slight effect on human attitude). The changed climate is also one of the reasons for increased depression among people…. There is plenty to be said on America and their puppet like orchestration of countries in order to succeed in America's governors pro-globalist agendas but I guess mostly anyone who is a thinker already has in-depth thought on that too. What is the reason for this terrible world crisis? Its trendy to speculate the reason for the crisis is the downturn in local countries economies. Though its a fact there is a strong relation between the crisis and the countries economic downturn. Having defined a certain economy being in a downturn does not explain the root of the economic problem. Defining the economic crisis being there is just like defining the symptom of a disease without knowing the exact disease type. Hence talking about economic crisis and how severe it is severeness, many companies news agencies and radios make a good money by creating all the time sensational news build on top of warped "half truths". This news however rarely reflect the reality "as it is" but mostly concentre on some fictionous idea of the journalist about the real economic situation. The end result is spreading of mass dilusion, fear uncertainty and doubt in citizens mind. Crisis word origin is derived from Ancient Greek language. Crisis word meaning translated to modern English means literally JUDGEMENT ! In the word judgement our ancestors were referring to God judgement for humanity unlawfulness. Having this perspective in mind when talking about Crisis is vital to understand our failing democracy nowdays which is based not on ancient knowledge but on man experimental framework. Obviously the ancient, people before the era of business were wise, a wisdom we now try to completely avoid and build on our own new experimental thinking. Experimenting is a great thing but only if you build on a solid base of previous scientifically repeatable experiences. The ancients could obviously well understand the reason for a a local or global crisis's stems from the in-justice in money / trade relations between individuals. With all said the best thing our companies and we as business people should do today is go back to the ancients knowledge and start doing business ethical and avoid deception and lies. Otherwise God will never bless the businesses of people and we will be under the continuous crisis for more and more until, we repent and realize that unethical behavior (not following the righteousness in relations) will never bring us good.